Lynette Coulston from iTandCoffee delivered the Keynote presentation. Lynette Coulston owns and runs Melbourne based business, iTandCoffee. After over 30 years in corporate IT, Lynette founded in 2012 – creating a business that is passionate about helping people enter and navigate the sometimes daunting world of technology – whether that be for business or personal use. iTandCoffee is not your typical IT provider, offering IT Life Support, not just ‘Tech Support’. 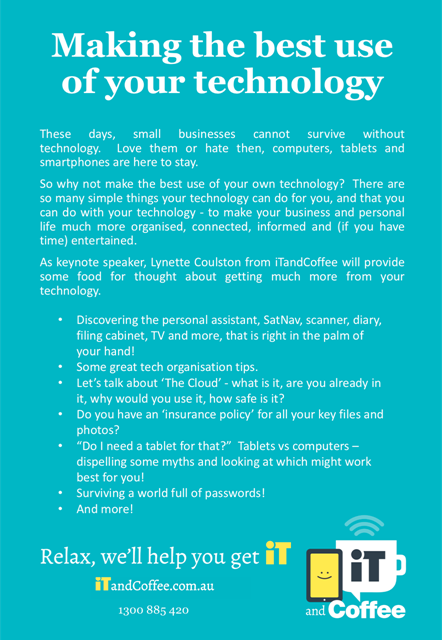 The focus at iTandCoffee is to help people to learn how to use their technology in a way that enhances their lives – making them feel more informed, organised, connected and productive. While many people use technology daily, they are not always getting as much benefit from their tech as they can. iTandCoffee is passionate about showing others what is possible, offering technology education that is relevant, relaxed, fun, social and empowering. Lynette invites all conference delegates and TNYV members to sign up for the fortnightly Handy Hints newsletter and to be part of the iTandCoffee Club. For a wealth of resources relating to the conference keynote address and more, click on the link below. Lisa Wiking from Motivational Leadership is a highly regarded leadership expert, speaker, coach, published author and trainer. She coached participants on making positive first impressions by email and on the phone. Or if you have any further questions please feel free to call me on 0408 711 769. Check out Lisa’s website for valuable resources or join her on Facebook. Eibhlin Haughney, Yarra Ranges Council Environmental Health Officer, provided highly relevant information on the following tourism related topics. Background into Councils Health Department & involvement in Yarra Valley Tourism. Brief info on food registration & Public health and wellbeing, Registration & requirements. Provide some examples of when things have gone wrong for businesses. E.g food poisoning/ untreated water. Link to other departments in Council where businesses might need to access permits/ registrations. How can council further support businesses? Booking.com was represented by Stewart Miller Senior Account Managers and Todd Todd Lacey Account Manager. To empower people to experience the world. Stewart and Todd presented an overview of the current trends in the online market space including regional statistics and tips on how to make your property more bookable.